“Buildings and office environments appear more calming and simply a nicer place to be when plants are present”. The “welcoming” presence is created by the sense of home and nature and this in turn creates the sense of comfort and ease. Perfect for office environments where stress levels can be raised due to “busy climates” or where customers come face-to-face with employees. What better way to sell something than by making the customer feel more comfortable and at ease. 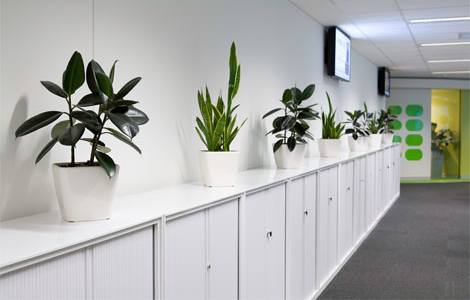 Another interesting fact that has been found is that noise levels are also reduced in the office by plants. The noise reduction will link to the decrease in stress levels, creating a happier environment. Being more economical, plants are a perfect choice to create a nice quiet environment for everyone to enjoy. I know what my colleagues are thinking now, I am starting to wonder when they will surround my desk with plants to quiet “Mr Chatterbox” down! Although, having the sense of working in a mini jungle will have it’s perks… I will have to let them all know that I am a fan of orchids! The majority of office locations are situated within urban areas, losing the sense of the countryside and nature. Although it is not necessary to set up an office space in the Eden Project (you would certainly need an air-conditioning system if working in a huge greenhouse), what better way to get a sense of nature than adding a few plants to the office space. This sense of the outdoors does wonders for your mental and physical health and it has even been proven that plants can reduce dry skin up to 20%! Synthetic plants are manufactured so well these days that they have the same mental health benefits, just in case you are like myself and watering plants will probably be an oversight! I am very pleased to learn that the cactus is a good one to have! Not needing much water will come in handy. Here at Office Reality it seems too much effort for someone to pour water into a mug for a cuppa (looking at you Mark), nevermind watering plants! Unfortunately my suggestion of having an indoor Zen Garden has been shot down. Something about sand getting everywhere..? Bleh! However, I am sure I can sell the idea of having a Cactus in the office with the use of this blog! I will have to keep you all posted on the benefits that we all feel if we get one and manage to keep it alive. Might be an idea for a team building exercise? !